Led Q'ty: 200pcs (Bi-Color 100pcs white 100pcs yellow led beads). Powerful LED light with High power, low heat value and Long service life. Professional LED driving IC and no flicker light with the efficiency up to 93%. Adopts concentration LED lights, irradiation distance can reach more than 5m, suitable for long distance shooting. Illumination: 950Lux (1m), 240Lux (2m), 120Lux (3m), 70Lux (4m), 40Lux (5m). 2.2 filters included with this item, with Spotlight effect, Diffuse effect, and for reducing the color temperature to 3200K. Specifications: *Material of the Lighting's Shell: ABS Plastic *Maximum Power: 11 Watt *Color Temperature: 5600K (3200k w/filter) *Max Lumens: 950 lm *Working Time: 60-80mins *Illumination: 950Lux (1m), 240Lux (2m), 120Lux (3m), 70Lux (4m), 40Lux (5m) *Effective distance: 20ft/6m 29"/73cm Tall Studio Light Stand(x2) *Easy way to set up, quick release and lock system fitted for the fast and easy used. *Light weight and easy to carry. * *Material: Aluminum *Max. Load: 10-15kg / 22-33bls. Total illumination: 4800LM. 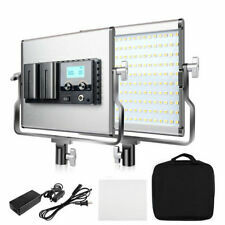 TRAVOR 18" 55W 5500K Ring 240 LED Video Light Makeup Lighting Kit & 2m Stand UK. 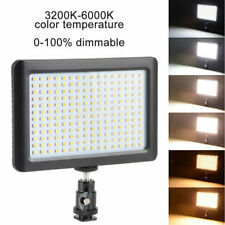 -Dimmable 18" LED SMD Ring Light with a wide dimming range from 1%-100%. -CRI (Color Rendering Index): 90. 1 x Yongnuo YN360 Video Light (3200K-5500K). Model : YN360. Color temperature: 3200K, 5500K and RGB full color. Color Temperature : 3200K / 5500K / RGB. Luminance Angle: 55° and 110°. 39.5cm long lamp panel for fill-in light. Godox SL-60 Video Light offers high light brightness and color rendering index with high-quality LED beads, presenting the objects authentically. The video light is equipped with a remote control to adjust brightness and grouping dimming wirelessly, and a large LCD panel to display the brightness and temperature precisely. It’s creates stable light resource and even illumination for video recording, photojournalistic and wedding shooting, etc. Features: -60Ws high quality LED bulbs guarantee high brightness and stable light source. -The color rendering index is over 95, R9 is 90 and TLCI(Qa) is over 90, presenting the objects authentically..
Dimmable 18" LED SMD Ring Light with a wide dimming range from 1%-100%. -Dimmable: Stepless dimming. -Total illumination: 4800LM. TRAVOR 18" 55W 5500K Ring 240 LED Video Light Makeup Lighting Kit & 2m Stand UK. Viltrox L116T LED Video Light adopts the newest LED honeycomb design. Model: L116T. 1 L116T LED Video Light. Brightness / illumination: 987LM / 810Lux/0.5m. ---It has high brightness, nature and soft lights, adjustable color temperature(3300K-5600K). 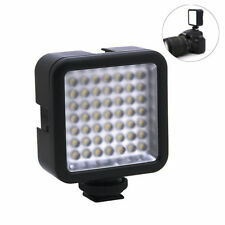 1 x Yongnuo YN300 AIR3200K-5500K Pro LED Video light. Luminance angle: 110°. YN300 Air supports using NP-F lithium battery or external 8V,5A DC power. and it makes YN300 Air video light much suitable for filling light from a close distance. Dimmable: YES. Luminance: Max 860lm. Rotating the switch can adjust the brightness without filter plates, suitable for a variety of photography atmosphere. Beam Angle: 120°. The magnetic semi-transparent cover can be used for protecting battery or LED, also a useful filtered plates, clear or orange. Max Beam luminance:2200Lm. Brightness and Color temperature adjustable with the white and Orange Filters 3200K/5600K. With Mini Ball Head and could adjust the lighting angle 360 degree. -Power Source: NP-F550 battery (Battery Included). 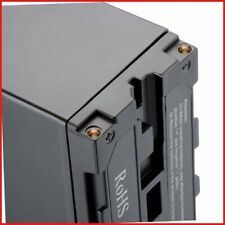 Dual battery position and support NP-F550 /NP-F750 ,NP-F970 battery. Led Q'ty: 200pcs (Bi-Color 100pcs white 100pcs yellow led beads). Powerful LED light with High power, low heat value and Long service life. Specifications: *LED Qty :240pcs *Material of the Lighting's Shell: ABS Plastic *Maximum Power: 24 Watt *Color Temperature: 5600K (3200k w/filter) *Max Lumens: 1200 lm *Working Time: 60-80mins *Illumination: 1200Lux (1m), 780Lux (2m), 560Lux (3m), 430Lux (4m), 200Lux (5m) *Effective distance: 20ft/6m *78"/200cm Tall Studio Light Stand(x2) *Solid safety 3 legs stages. *Easy way to set up, quick release and lock system fitted for the fast and easy used. *Light weight and easy to carry. *Material: Aluminum *Max Height: 78"/200cm *Max. Load: 10-15kg / 22-33bls. The Amaran AL-F7 is an updated version of Aputure’s popular AL-H198. It has a maximum brightness of up to 14000 lux 0.3m with a 45-degree beam angle. It features an exceptionally high color accuracy rating, boasting a CRI and TLCI of 95 . Featuring an expanded bicolor range of 3200K-9500K, the F7 allows you to light any scene imaginable and makes it easier to control your brightness and color temperature. Lightweight and compact, affordable, and of course, extremely bright. Features: 1. High Color Rendition . Ultra thin and lightweight, with mighty power and balanced luminance. Hot shoe with 1/4" screw hole suitable for most DSLR and tripod. 192-LEDs for optimum illumination and diffuser, ensuring your pictures' perfect settings. Travor Model: TL-600S. -Max Beam luminance: 2200Lm. Equipped with 2m light stand with 1/4’ standard screw could put the light on the tripod. Brightness and Color temperature adjustable with the white and Orange Filters 3200K/5600K. Stable color temperature and standard Bowens mount, really a professional studio flash. It will undoubtedly perform great. 60W LED bulb, high light brightness ranging from 10%-100%. 1 Reflector Shade. SOKANI X21 is very thin and only 100g weight, so that you can put it in your pocket. Made of aircraft-grade aluminum, it is compact and durable, which assures it is built to last for years in conditions of all kinds. With 660 White LED long lasting bulbs, this light illuminates an even and stable output up to 5600K. Single-Color 660 LED Light: 232x200x48mm. Colour temperature: 5600K. UK mains adapter with detachable power cord. Included: 1 x Waterproof 3LED Diving Fill Light with Battery. Mode: highlight files, save power mode, flash SOS. Highlight the file: 80 minutes. Power saving mode: 6 hours. Due to the different display and different light, the picture may not show the actual color of the item. YN300 III adopts YONGNUO proprietary LED driving technology which does great help to effectively avoid corrugation and stroboscopic flash. 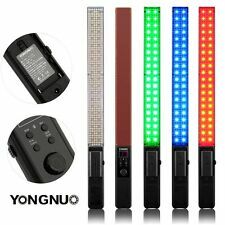 YONGNUO NP-F750. yongnuo AC Adapter. Luminance Angle: 55°. YN300 III adopts encoder digital dimming system, including coarse tuning mode and fine tuning mode. Luminance Angle: 120°. Light Source: 96 LED beads. Color Rendering Index: >93. 1x 96 LED Video Light. Can also mount on lamp stand with 1/4"" screw. Color Temperature: 3200K/5500K. 1x White filter. 1x Yellow filter. Ring-shaped designed, with eye protection LED lamp beads, low consumption, high brightness and 3200K-5500K adjustable color temperature, this LED ring light will give you excellent shooting experience. You can use it as a fill-in light for pictorial shooting, network broadcast, wedding shooting, still lift shooting, etc. .
Color temperature: Adjustable 3200K~5600K. Powerful LED lamp with high power, low heating value and long service life. Turn the knob counterclockwise to decrease the color temperature. Supporting battery adapter to keep the long lasting. Phone Clip Size: 6-10cm. Light Color:Warm light, White light, Warm white light. 1 x Ring Light Tripod Stand. Interface: 1/4 universal screw hole. 1 x Ring Light. ► Makes sure every video, selfie and photo is perfect. Part of My ongoing downsizing. Used once, so pristine. Tungsten lights for desk top / still life photography. Model:L4500 LED Light Features: Powerful LED light with High power , low heat value and Long service life Equipped with LCD screen , display more intuitive and control easily Feeling comfortable , precise and convenient because of the dimming of knob Professional LED driving IC and no flicker light with the efficiency up to 93% Dual battery position and support NP-F550 /NP-F750 ,NP-F970 battery Supporting battery adapter to keep the long lasting . Be durable of the product because of the meter materials . Specification: Model Number: L4500 Led Q'ty: 200pcs (Bi-Color 100pcs white 100pcs yellow led beads). Used for one job so in great condition. I have replaced the cable with a standard uk plug, and will also include an extension cable. 1 x diffuser. each kit includes. 1 x power brick with cable. This kit includes X 3 panels, X 2 F&V softboxes, X1 softbox grid, power adapters, cables, and a carry case. You can use V-lock batteries with these lights. ✔CE&RoHS✔350W Equal✔Dimmable✔240PCS LED bulbs✔UK Plug ! Feature: 2800-6500K Wide Color Temperature: Aputure AL-MX features a 5-step adjustable color temperature ranging from 2800-6500K, provides you with even more options for creative applications 3200lux@0.3m Booster Mode: Aputure AL-MX comes with a bonus Boost option, which goes above 30% of maximum brightness when you need that extra kick. Capable of operating at 60-second intervals Durable Metal Build Quality:. Travor Model: TL-600S. Max Beam luminance: 2200Lm. -3200K/5600K adjustable with tungsten filter. -Variable power with 10 levels of brightness upto 4600LM. -With Touch Screen could adjust the Brightness. Therefore, the Iwata GL-01 will not create the stroboscopic light under different brightness and color temperature. Adopting LED soft light technology, the Iwata GL-01 providing uniform illumination which is soft but not glaring. Adopts concentration LED lights, irradiation distance can reach more than 5m, suitable for long distance shooting. 2.2 filters included with this item, with Spotlight effect, Diffuse effect, and for reducing the color temperature to 3200K. ✔CE&RoHS✔300W Equal✔Dimmable✔60PCS LED bulbs✔UK Plug !